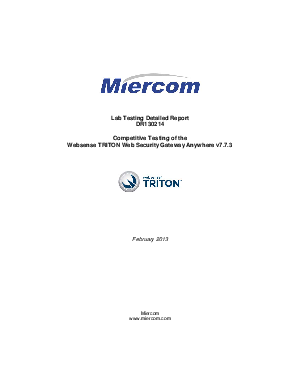 Miercom conducted an independent third-party validation of the Websense TRITON Web Security Gateway Anywhere (WSGA) version 7.7.3, with comparisons to McAfee Web Gateway 5500, Blue Coat ProxySG 900, version SGOS 6.4.1.2 Proxy Edition, Cisco IronPort S370 AsyncOS 7.6.1, Palo Alto Networks PA-2020, version 5.0.1 and FireEye Web MPS 1300, version 6.2.0. Standard security tests were performed to verify the detection, blocking and operational capabilities on multiple areas of real-time malware threats, modern malware, sandboxing and forensic reporting. The ability of the appliances to correctly identify threats from a large sample of web requests of an unknown nature emulated what the solutions need to provide when users click on web links. This point of click protection testing also focused on specific stages of advanced threats, or the cyber kill chain, such as lures, exploits and dropper files. We also evaluated the ability to stop sensitive information leakage or theft, such as financial, social security numbers and other sensitive private information. Implementation of the Data Theft Protection policy within Websense TRITON WSGA was thoroughly exercised to ensure the effectiveness of these policies when put in place. Ease of management was tested by performing a time and motion study for typical management tasks. We noted whether any additional elements were required to perform these tasks. Detailed test results demonstrate a clear advantage for the Websense TRITON WSGA solution in virtually every area measured.